For any inquiries or questions about your race packs or running results, please contact info@gotorace.com. Under the slogan “Take Charge of Your Health”, AIA Vitality has decided to organized the first virtual run called “AIA Vitality Virtual Run 2018”. A virtual run is a form of flexible running events that meet the need of health lovers, who preferred to schedule their own running time, speed and location themselves. What is Virtual Run ? A virtual run is a flexible running event that runners can participate from any location, at any pace, on a treadmill or even in another country. The run course is decided by the runner himself/herself. There are 2 distances that you can choose to join: 5 KM and 10.5 KM, and the running period is from 5 – 16 December 2018. How to record your running result ? By using a GPS app to record your result during your run (i.e. Garmin Connect, Fitbit, Apple Health, S Health, Runkeeper, Strava, Endomondo, etc.). By using a health app to record your result during your run (i.e. Garmin Connect, Fitbit, Apple Health, S Health, etc.). By taking a photo or a screenshot of your race result from other running events that you will join during 5 – 16 December 2018. If you happened to run on a treadmill, you can also take a photo of the result once completed your registered distance. How to send in your result ? From 5 – 16 December 2018, you can submit your running result here. Fill in your bib number, finished time and upload your race result picture. 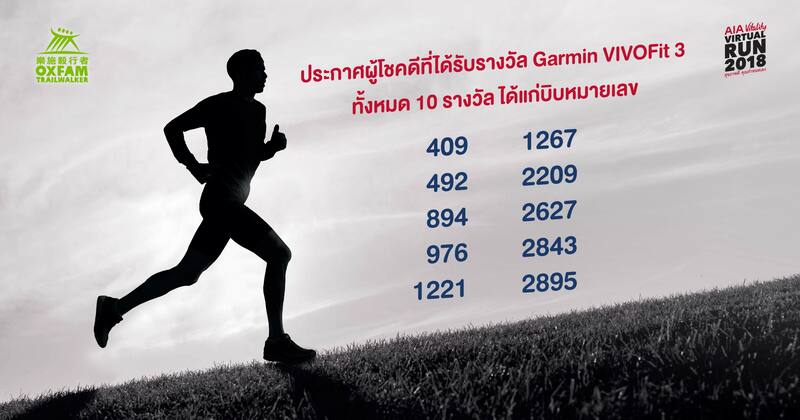 Only those who have submitted their result within 16 December will get a chance to win a Garmin VIVOFit 3, worth 2,590 baht each. There are 10 watches up for grabs. The lucky 10 winners will be announced no later than 25 December 2018. What is in a race pack ? 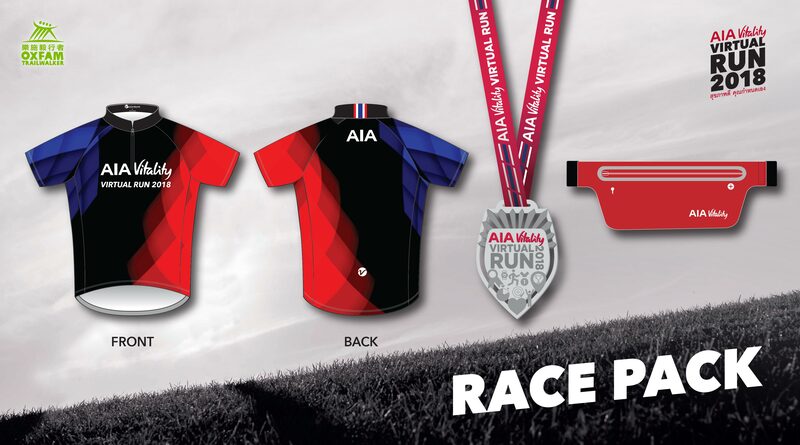 AIA Vitality Virtual Run 2018 running shirt – slim fit style. Made with “Pro Team” fabric that is breathable and padded with Dry Fit technology. Perfect for running. 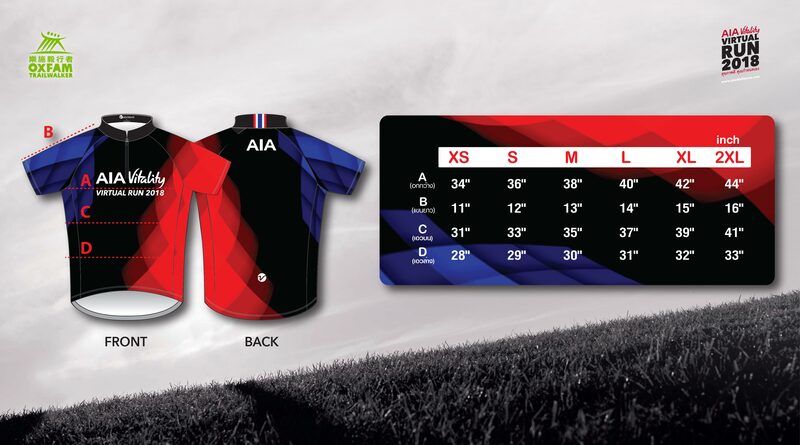 There is NO size change allowed for the AIA Vitality Virtual Run 2018’s running shirt (slim fit). Waist bag for running with a 64 – 88 cm waist circumference. Commemorative medal to both 5 KM and 10.5 KM run. EMS Postal Service – the race pack will be sent out individually. We do apologize in advance that we cannot send the packs out in bulks to one address.